Foldforming Central is a friendly and supportive group of metals artists around the globe interested in foldforming techniques. Its home is on Facebook in a closed group environment where members can ask questions, assist fellow metal artists, and share work with each other. Occasionally, the work of Foldforming Central members will be featured under Resources / Community as a Member Spotlight on www.foldforming.org. This is one such profile. Shiny things. Ha. 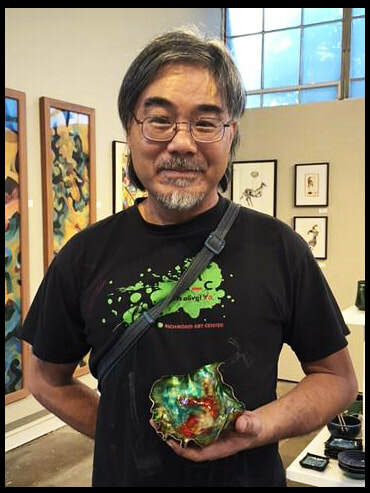 Ed Lay's art has earned recognition in the Lewton-Brain Foldform Competition repeatedly over the years. Scroll down to view other works recognized by this event to date. This year, Ed Lay won the 2017 Innovation Award for his "Fold Forms in Glass." It's all the more exciting because the piece bends our competition rules-- but innovation should push the boundaries, right? In this case, there is no metal in the piece. 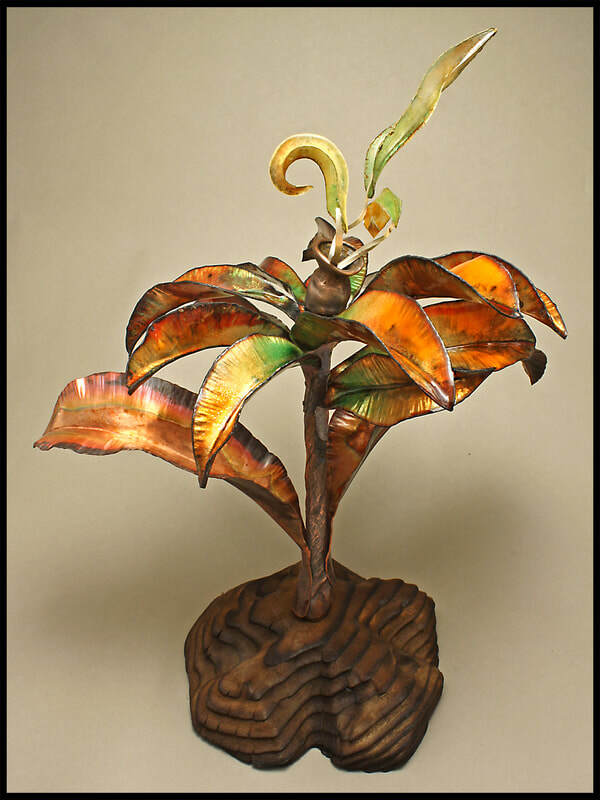 Metal is the negative space, and essential to creating the glass form. Ed has submitted a detailed technical write-up for his work with metal and glass, below. Artists will no doubt appreciate his generosity in sharing this information. 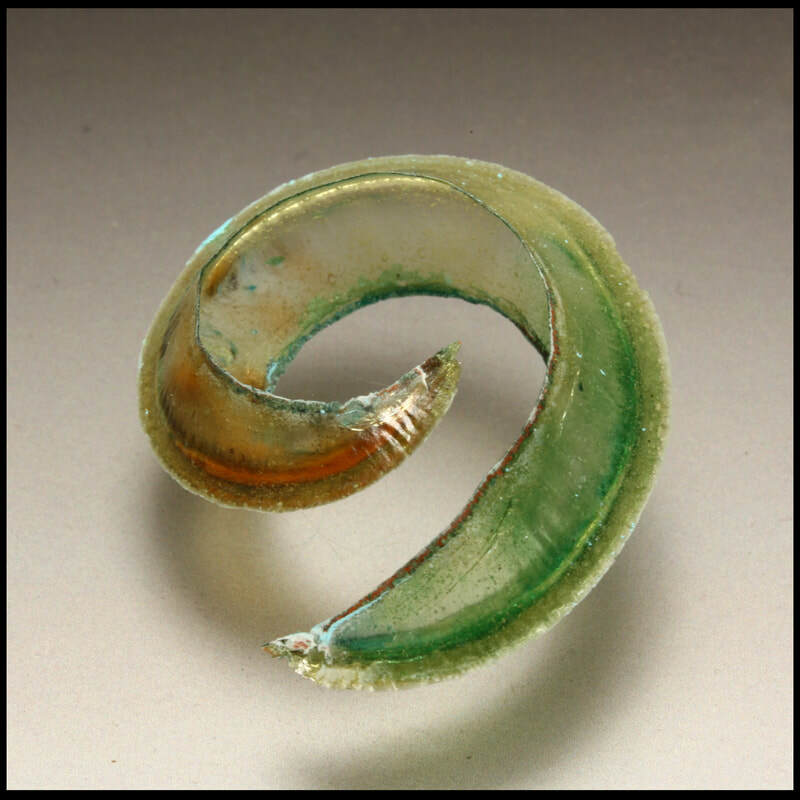 Ed Lay won the Innovation Award in the 2017 Lewton-Brain Foldform Competition for his explorations in glass forms using foldforming in metal. He has generously provided a technical write-up of the process below, including plans for future experimentation, for others who might like to take a crack at this. ​The process for making foldforms in glass is conceptually straightforward. However in practice, one quickly runs into some inherent technical difficulties, mostly related to the properties of glass. 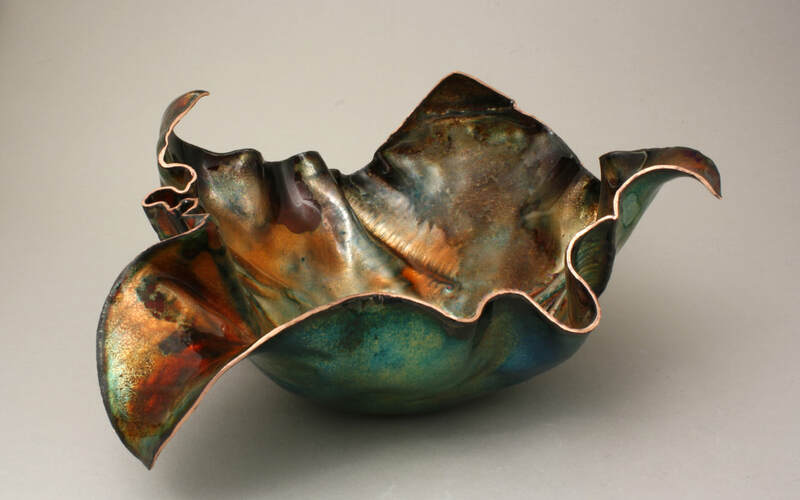 Starting with thin copper sheet (24-26 gauge), 1-2.5" long, the metal is folded, trimmed, hammered, annealed and unfolded. Initially the forms were restricted to simple Rueger folds but there is nothing about the process that precludes more complicated folds. 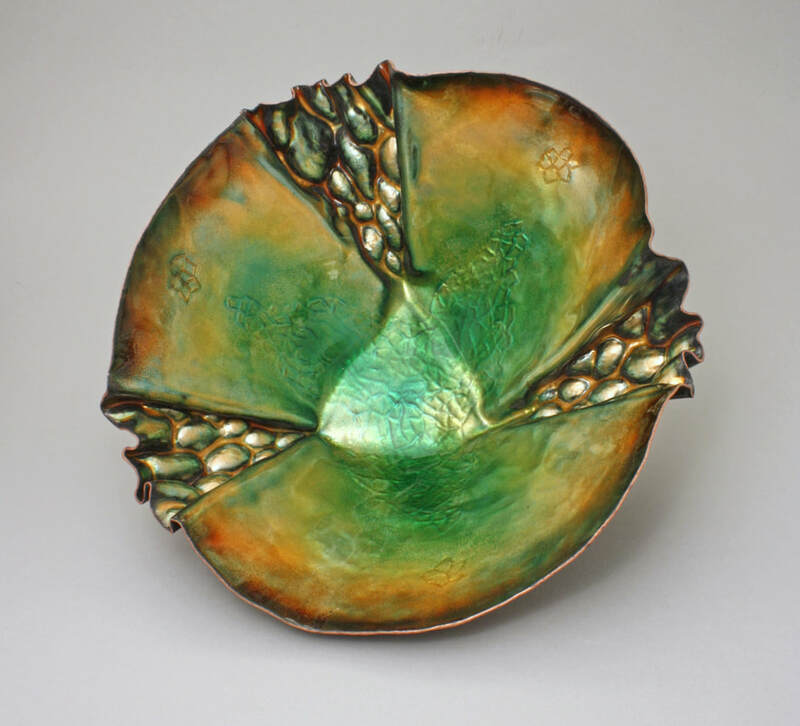 After opening, 1-2 layers of clear enamel were applied and fired to the inside of the forms. 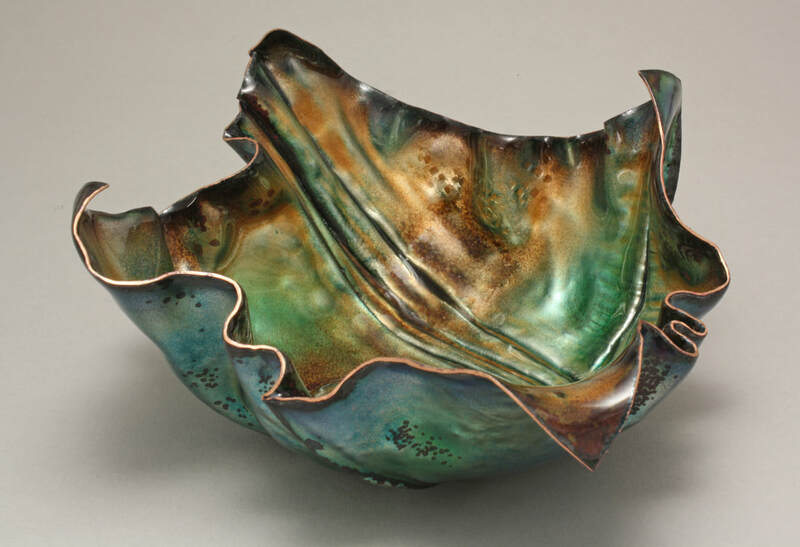 Closed forms with a lot of curvature need to be wet packed, while the enamel can be sifted onto the more open forms. Two or more layers of colored transparent enamel are then applied. Extra attention is taken to keep the thickness even throughout the form. 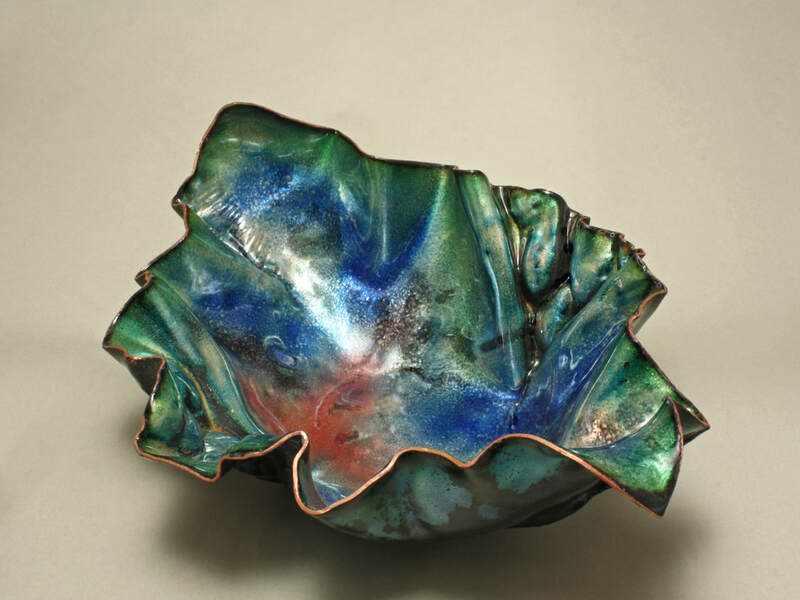 The enameled form is then placed in an etching bath (Ferric Chloride). 8-12 hours later, only the glass is left. The primary difficulty in this process is that the lack of counter enamel (enamel on the other side of the metal) very quickly leads to stress cracking of the glass when cooling. This phenomenon places an upper limit on the possible thickness of the enamel because the thicker the glass is, the greater the chance of cracking. At present, that limit is about 0.5mm. The result is very fragile objects that must be handled carefully. 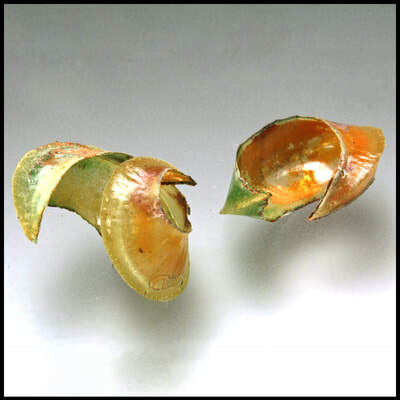 Open forms seem more susceptible to cracking than highly curved closed forms. Some of the open forms had to be stabilized with a clear epoxy prior to etching. Slow, controlled cooling similar to a glass annealing cycle was tried with mixed results. Partial Etching: Removing the forms from the etch before all the copper is gone. Patches of paper thin copper clinging to the highly textured glass have an almost archeological aesthetic. Starting with thicker metal to delay the onset of cracking. A longer etch time is the trade off. Experimentation with the etching process. Heat and agitation will speed up the process. Galvanic etching might also be a way to speed up the etch. The Innovation Award prizes for the 2017 Lewton-Brain Foldform Competition included a set of three handcrafted paper hammers, a subscription to Lapidary Journal Jewelry Artist magazine and a Ganoksin membership.